“We create dunkers”. Or so the BoingVERT slogan would have you believe. 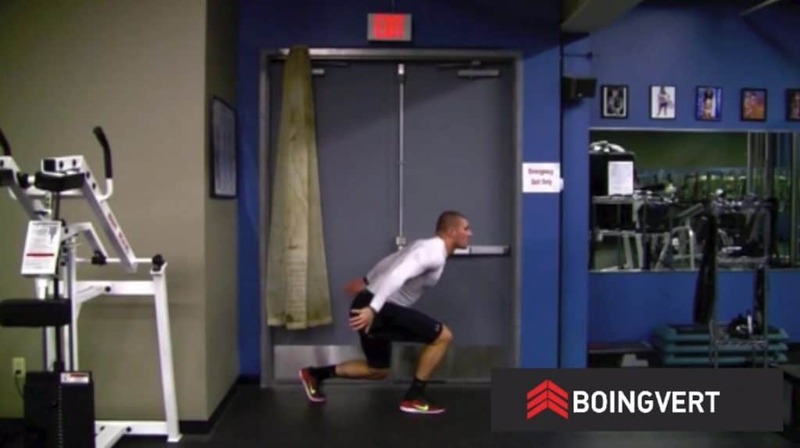 BoingVERT is a vertical jump training program released back in 2011 by Shawn Myszka and Kelly Baggett – most likely in response to seeing the huge success of Jacob Hiller’s Jump Manual that was released a year earlier. At release, BoingVERT made a big YouTube marketing push and to this day there are hundreds of promotions and dunk reels with BoingVERT branding. As a result, it’s hard to filter out real user reviews or non-affiliate insights into the program. 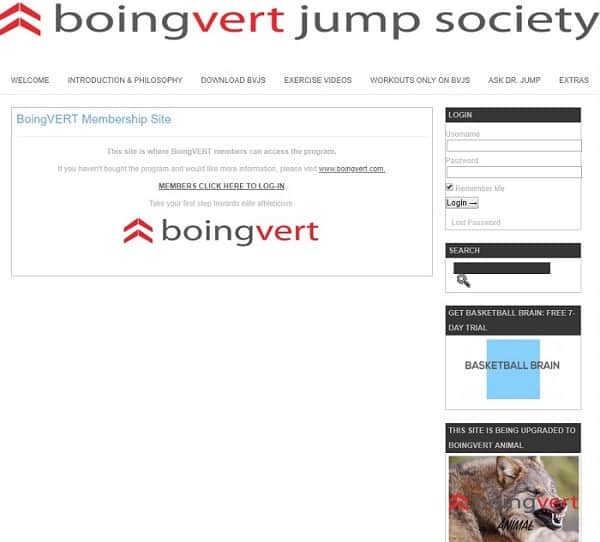 In our latest jump program review, we dug deep into what BoingVERT offers and how it compares with the other mainstream jump programs out there. Unfortunately, despite a solid workout routine, BoingVERT falls short as a jump training program in almost every other respect – ESPECIALLY its archaic navigation and presentation. BoingVERT is a vertical jump training program that aims to help users increase their vertical by 10 inches over 6 months. It involves plyometric and weight based training which are the bread and butter of pretty much every other jump training program out there. The program is split into two parts. In the first part you’ll be training for speed and explosive power over a 16 week period. In the second part, you’ll be doing 11 weeks of weight training to build up your strength. In total, you’ll be spending over half a year working on your vertical jump. Speed and strength are the two fundamental ingredients for a powerful vertical jump and this program focuses on each in isolation. 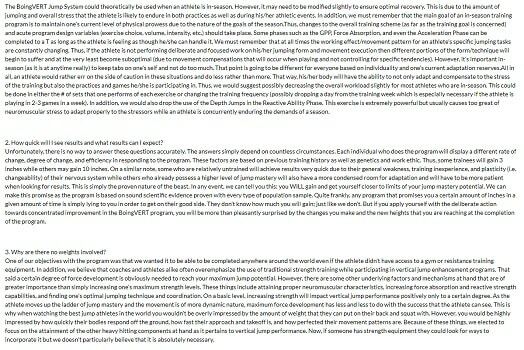 While all this sounds good on paper, you’ll find that almost every other jump training program aims to deliver similar results over a much shorter time-frame. For example, our top-rated program, Vert Shock, lasts 8 weeks and our second favorite, Jump Manual, lasts 12 weeks. Why does BoingVERT have such a long course duration? Is it fundamentally a more in-depth program? No. The program was originally lacking a strength-building component and so in 2016, the program was updated with the 11-week strength program. As a result, we have effectively ended up with two separate jump training programs being glued together. 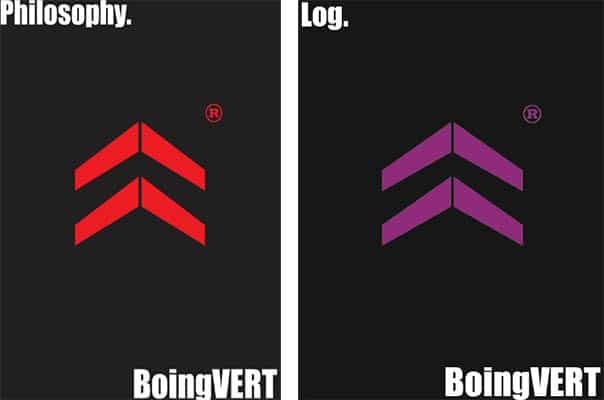 BoingVERT was originally only a 16 week plyometric program which consisted of 2 downloadable PDFs and exercise instruction videos. People could purchase it for just $7, a price point significantly below other premium jump training programs. Shawn revamped BoingVERT in 2016. Goodbye to the original “BoingVERT Jump Society” website, the program was re-branded using the much sexier names ‘Animal’ and ‘Monster’. The thing that is perhaps most annoying about the 2016 revamp is trying to decipher the various names used in the program. It took us a while to figure what everything meant so we’ll save you the hassle. BoingVERT Animal – This is just the original 2011 BoingVERT program. It is 16 weeks long and trains your explosive power. BoingVERT Monster – This was the big new addition for 2016. It is an 11 week weight-training workout routine to develop your strength that should be done after completion of Animal. 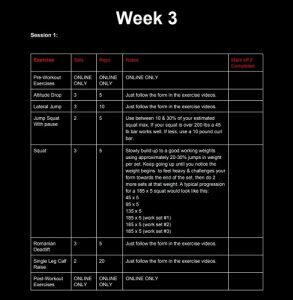 BoingVERT V3 Air Warfare – Possibly the most confusing of all, this is a 12 week program that is like animal but with weightroom training. 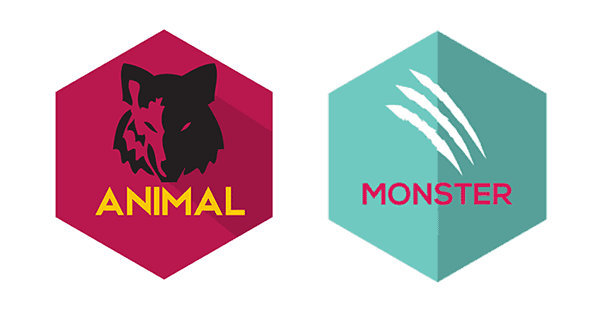 It is sort of like a standalone mix of Animal and Monster, but the recommended progression is still Animal + Monster, so we’re not sure why this exists or what purpose it serves. As soon as you think you’re just about done with all the Boing-something, you’ve got various supplemental information in the form of BoingMINIS. 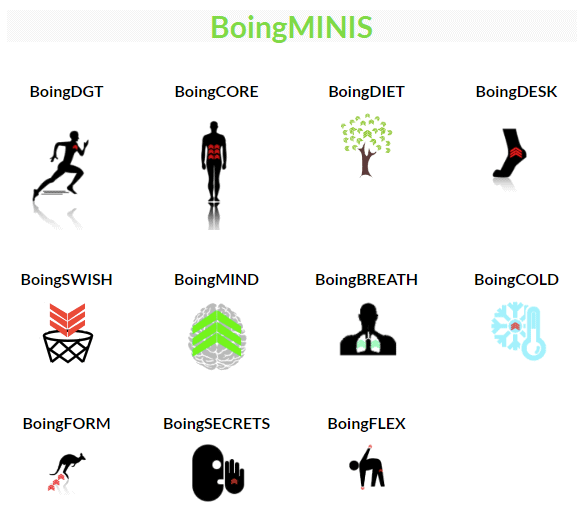 BoingMINIS – BoingDGT, BoingCORE, BoingDIET, BoingDESK, BoingSWISH, BoingMIND, BoingBREATH, BoingCOLD, BoingFORM, BoingSECRETS, BoingFLEX. Aside from BoingDIET and BoingMIND, it’s impossible to infer what any of these things are really about. Needless to say, none of them are particularly noteworthy. To cure your curiosity, BoingDGT stands for Boing Don’t Get Tired. Come on now, really? With the 2016 revamp there is also a new pricing system in place. You can purchase Animal alone for $10, but then you’re missing a lot. Right now the Monster+Animal combo deal appears to have disappeared. Therefore, to follow the recommended training path (Animal and Monster) you’ll need to pay $79.95 for the lifetime membership option. We certainly don’t think Monster is worth an additional $70. The lifetime membership includes the BoingVERT Minis and future updates, but these are more or less pure gimmicks. This actually makes it one of the more expensive jump training programs out there. Our top-rated vertical jump program, Vert Shock, costs less and is much better value for money in our opinion. The core program, Animal, is exactly the same as it was in 2011. The only difference is the new animal-themed program portal. Exercise videos are the same ones from 2011 and the PDFs are also unchanged. As a result, the core program of BoingVERT feels very neglected. Things wouldn’t be so bad if the original program was already well done, but that isn’t the case as you’ll see below. In any other jump program review, we’d primarily focus on the actual workout routines and program effectiveness. Things like the member portal or website navigation should just be a secondary ranking criteria. 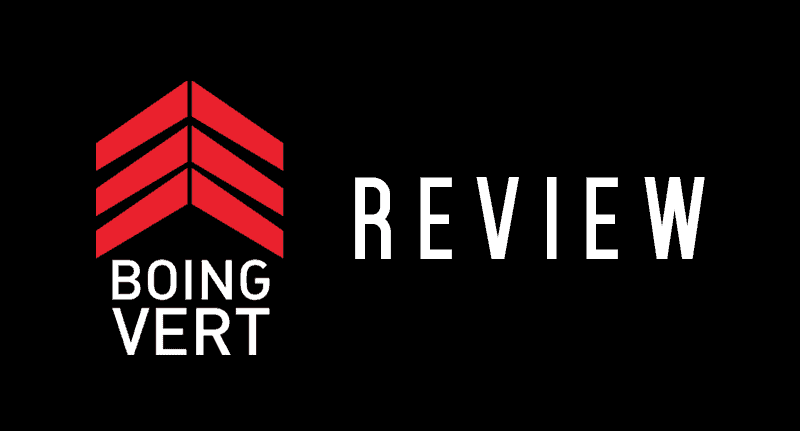 However, in the case of BoingVERT, the user experience is so poor to the extent that it became the main focus of our review. The program is incredibly confusing for newcomers. The main navigation portal is just a bunch of buttons with no clear explanation of what anything is. In order to access the core program, you must first select BoingVERT Animal, and then you’ve reached the Animal program portal. From here, you’ll need to find your way to the actual workout program. It’s so counter-intuitive that they’ve gone out of their way to give out instructions on how to find the actual program! There’s simply nothing intuitive about navigating the program, meaning you’re always lost. Other jump programs are far more intuitive. They have a linear progression, starting with an introduction and then guiding you through everything step by step. The Jump Manual was released before the original BoingVERT, yet still manages to be much more user friendly. With BoingVERT, they’ve just chucked everything in a basket and expect you sift through the mess. I am not sure if I have EVER seen such great walls of text with absolutely no images in any kind of guide. Walls of text are found throughout the course, be it the program PDF or FAQ. With no visual stimulation and poor use of paragraphs, users deserve a medal if they can get through it all. You are only allowed to make 5 downloads in a 365-day period. You’ve got to be damn sure to save those downloads somewhere as downloading even the same file twice counts towards your download quota. I don’t know why this is a thing, but if it’s some kind of copy-protection measure it isn’t effective and only ends up inconveniencing legitimate, paying members. No other jump program does this. The Animal PDF hasn’t been changed since 2011 and tells you to activate your jump society membership and purchase BoingVERT Blast Off! – otherwise you are missing half the program. Oh no! As it turns out jump society membership and BoingVERT Blast Off! aren’t even around anymore. New users will scratch their heads over why they are being told they don’t have the full program as soon as they open the PDF. On top of that, the written material is all rushed. Not only have they not bothered using any images, there are grammatical errors everywhere. All in all, the BoingVERT is completely void of the kind of professionalism you would expect from a paid training program. 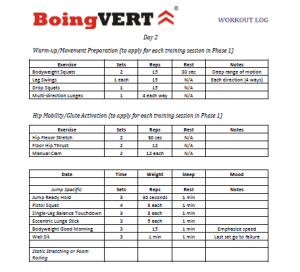 While BoingVERT is a poorly organized and presented jump program, thankfully the workout itself is a decent one. 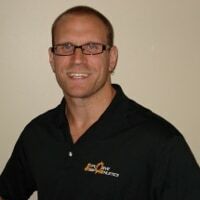 Behind the training regimen is Shawn Myszka (MS, PES, CSCS*D), an NSCA certified strength & conditioning specialist and Director at Explosive Edge Athletics Pro Performance. He specializes in helping football players become quicker and more agile, and has also been a headline presenter in numerous athletics and coaching conferences. Shawn teamed up with Kelly Baggett in order to get help creating the new Monster weight-training module that was added in 2016. Kelly authored the Vertical Jump Bible, a book published in 2005 that forms the basis of many more recent jump training programs. As a result, the workouts have been created by very credible training experts. Let’s take a closer look at the Animal and Monster workouts in more detail. BoingVERT Animal is the vanilla BoingVERT program that was around before the 2016 revamp. It comprises of a Jump Philosophy eBook, a printable workout log and exercise instruction videos. It is BoingVERT’s core program as it only involves plyometric and other body-weight exercises. These are the most effective type of exercise (unless there is a big strength deficit) for increasing one’s vertical jump. You should start the program by reading the 32-page Jump Philosophy eBook which outlines general principles and theory behind the vertical jump. It discusses some interesting vertical jump factors that you probably hadn’t considered before, such as stretching, landing absorption and the key muscle groups. While it certainly contains valuable information, unfortunately it isn’t written in layman’s terms so some of the concepts are somewhat confusing. For the actual workouts you’ll need to download the Animal LOG PDF file. The workout plan literally has a separate log for EVERY day of the 16 week training period, meaning you’ll have to print out 93 pages. Other programs have much better organized workout logs. The GPP phase prepares your body for the rest of the Animal workout. While the exercises will still improve your vertical jump, the main objective is to improve overall stability in key muscle groups, fix muscle imbalances and increase neuromuscular efficiency. The phase lasts 3 weeks, with each week involving 3 workout days and 4 rest days. The purpose of the Jump Mastery phase is to optimize your jump movement patterns. You will work on increasing the synergy and overall coordination between muscle groups. For many, this phase will produce the biggest results, especially if you’re the kind of person who doesn’t regularly jump. This phase focuses on the negative motion during the jump where you bend your knees into the jump. It is a crucial and often-neglected area of development. By increasing the amount of energy you store through force absorption, and being able to efficiently utilize that stored elastic energy, you will be able to jump higher. The idea behind phase 4 is to quicken muscle contraction and be able to generate more power in a shorter amount of time. This is a key factor in explosiveness, and given that you only have around 0.2 seconds to generate the power for your jump, your muscles need to be functioning as fast as possible. Fast, explosive movements like tuck jumps and sprints take up the bulk of the workouts here. The penultimate phase will build your reactive strength. This type of strength enables you to quickly change direction and you will train it by overloading muscle stretch-shortening cycles. Depth jumps, which involves a greater than normal reactive element, are the biggest focus of this phase. The final phase is similar to phase 2 and once again refines jump technique and coordination. It is a nice way to round off the program, ensuring that the gains from the previous phases are not hampered by poor jumping motion. Overall, the 6 phase system nicely covers all jump variables in a targeted manner. However, I personally feel the Animal workout does over-complicate things. A good jump workout will naturally develop all aspects of a vertical jump, without having to focus on each area in isolation, unless an individual has a particular weakness. The Monster program module, which was added to BoingVERT in 2016, is an 11-week strength training program. Increasing sheer strength is important to increase your maximum potential power output. Provided you have developed agility through Animal, you will be able to effectively harness that strength to produce a powerful jump. The adaptation and activation phase prepares your muscles to get used to resistance training. It minimizes any risk of future injury and enables a smooth transition into the following phases. In the second phase, you’ll do fairly basic compound weightlifting exercises (with a bias towards leg exercises) that build a good foundation to build upon. The purpose of phase 3 is to increase your maximum strength and power through low-rep, high-load weightlifting. Maximum power is a key variable of your vertical jump since your body will be able to utilize a fixed percentage of that maximum power during a vertical jump. In the final phase, you swap out slower lifts like the standard squat for quick, explosive movements where your body needs to fire off as many muscle fibers as possible in a short amount of time. The intensity of this phase is the biggest of all 4, but it is also where you’ll see all the hard work in previous phases pay off. Again, the Monster program has accompanying exercise instruction videos. Note: The Monster Workout Logbook has a black color scheme that means you won’t want to print it out unless you have unlimited black ink! Before we finish off the review, here’s a quick summary of the program’s pros and cons. While the lifetime option which includes Animal, Monster and any future updates costs $79.95, you can purchase the Animal program alone for $10. Be warned though, if you’re serious about committing 16 weeks to vertical jump training, trying to save every dollar shouldn’t be your main concern. Just as you would expect from someone who deals more with coaches than your average Joe, BoingVERT goes into intricate details. If you read the Animal Philosophy PDF, you will definitely gain a lot of valuable knowledge, even covering things like the impact of training surfaces and footwear. Exercise videos are short and to the point, often featuring slow motion segments to make them easy to follow. Video quality is decent, although audio quality leaves a lot to be desired. The Animal program videos are recorded in standard definition while the newer Monster videos are recorded in High Definition. We can’t fault the brains behind BoingVERT. These guys created a workout routine that is based off their own expert knowledge in their respective fields. Nowadays many dunkers who lack the know-how are creating flashy jump programs without the fundamental training principles in place. As a result, the training regimen itself is an effective one that covers all bases, and knows which vertical jump training aspects should be prioritized. The whole program feels like something out of the 90s. Even the Jump Manual, which was released before it, feels miles ahead in terms of presentation and design. The eBooks contain walls of text with no images, talk about an utter eyesore! While presentation shouldn’t be the focal point in a jump training program review, you’re expected to invest 16-27 weeks of your time into this program. We don’t think you’ll find it easy to put up with such poor program navigation and layout for that long. Animal and Monster are decent programs in isolation, but Monster was made to make up for the shortcomings of the Animal program. BoingVERT just doesn’t feel seemless. Our favorite training programs incorporate speed and strength training from the get go. There’s therefore no such disconnect, cutting program duration and resulting in more efficient scheduling of training. For a program that goes by the slogan “we create dunkers” and showcases dunk reels for promotion, you’d expect the program to at least give a nod to aspiring slam dunkers. Perhaps because Shawn Myszka aka Dr Jump isn’t a dunker himself and has more experience with football athletes than basketball athletes, BoingVERT is short on any actual dunk technique instruction. There is nothing routine about the BoingVERT workout routines, because even within the same phases every training day is slightly different! While you could argue this makes the training more effective, for all practical purposes it just makes the program harder to follow. Before you workout you’ll need to check one of the 93 pages for the day and lookup how to do that one random exercise that’s there. In most cases, simpler is better, and the BoingVERT workout misses that by a mile. To me, BoingVERT could have been great, but poor design choices and lack polish holds it back immensely. The 2016 revamp tried to make it more appealing and exciting to a younger audience, but the content still reads like a boring physics textbook. All the Boing branding with meaningless names is confusing and obnoxious. The whole thing feels like a mess. Its creators are clearly knowledgeable about the vertical jump, but they’ve done a poor job wrapping up that knowledge into a digital download. Other vertical jump training programs have arguably more effective programs which are also better presented, so it’s hard to recommend this as anything other than a supplementary read for the curious. If you want to find out what our jump program recommendations are, check out our top 3 vertical jump training programs.